Breaks up congestion and stagnation and of qi at the center, dispels wind-damp and wind, resolves spleen damp, replenishes spleen qi. 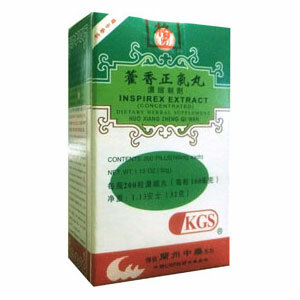 Restoring Health, which helps relieving exterior syndrome, eliminating dampness and regulating qi and stomach. A valuable herbal formula for poor digestion due to deficiency of spleen with phlegm-damp or food accumulation, causing nausea, vertigo, headache, pasty or loose stools, and flatulence. Excellent for wind-damp invasion of the stomach (summer-damp-heat stomach flu). Valuable in motion-sickness and morning sickness. Traditionally used in cholera. Poor digestion due to deficiency of spleen with phlegm-damp or food accumulation, causing nausea, vertigo, headache, pasty or loose stools, and flatulence. Excellent for wind-damp invasion of the stomach (summer-damp-heat stomach flu). Valuable in motion-sickness and morning sickness. Traditionally used in cholera. Spicy and greasy foods should be avoided. Do not take if you are pregnant or nursing.